However, I learnt something both incredibly simple and useful last week regarding the new HbA1c scale that we’ve been trickling towards for a while in Australia. If you’re like me, and breathed a sigh of relief when it was once again pushed back until the end of 2013, then read on! I should also note that one of the fantastic Aboriginal Health Workers at Durri AMS (my workplace) taught me this – yay for team-based AMS structure and medical care! Up until now, I’ve been relying on conversion tables like this excellent one from QAAMS that I have on the wall at work. But (revelation coming up!) you don’t actually even NEED this table with a simple trick to quickly convert whole integer (i.e. 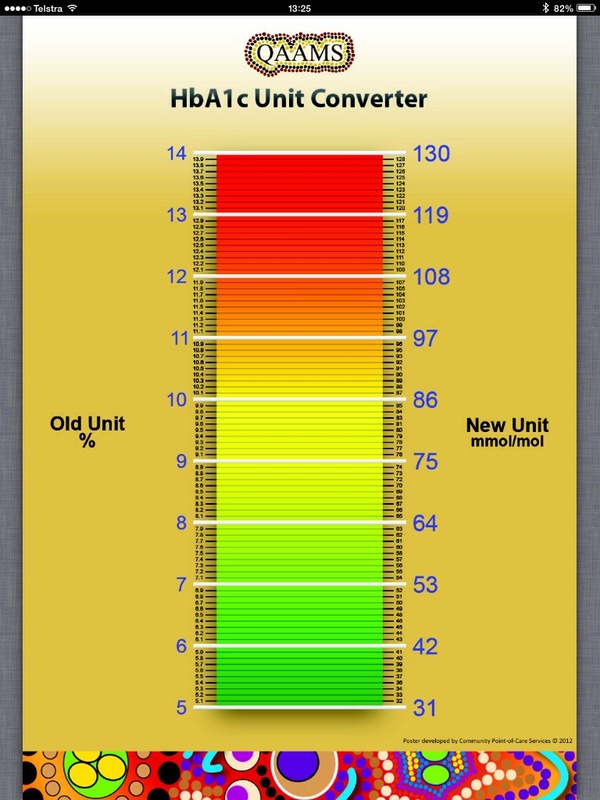 6, 9, 13) HbA1c values from the old percentage to the new mmol/mol. Take the HbA1c percentage – let’s go with 7%. To work out mmol/mol, simply subtract 2 (to get 5), and then 2 again (to get 3). The mmol/mol figure is 53! I hope you like this simple trick. It’s only small, but has made my diabetes consults A LOT easier. Brilliant tip! I’m going to share it tonight during my exam prep webinar with registrars and OTDs. Thanks David! This also works for decimals, you just have to carry.